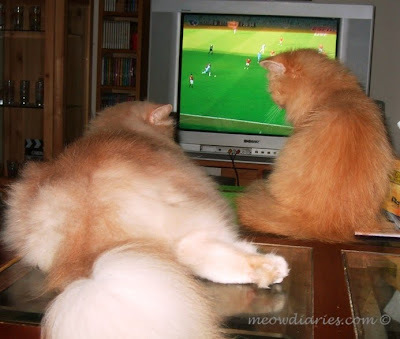 Our fluffy cats like watching TV with us especially if there's a football match on. They're so attentive when it comes to football; moving their heads from right to left following the ball wherever it goes. Usually their antics are really cute to see but sometimes it could get annoying especially when naughty Benji tries to play along by pawing the TV screen to catch the running footballer. He'd end up blocking our view! Phoebe loves playing ball and she likes to keep B company during his games. She'd be all dressed up in her red Liverpool tee, which drives Benji mad with envy. B is a Liverpool fan and he loves seeing anything Liverpool, Phoebe included! Speaking of football, EPL is back which means B has been on a football frenzy lately; conquering the TV every weekend! If it's not a Liverpool match he's watching, it's another team and the matches seem to go on endlessly, one after another! Every match that goes on, I'll ask B if he won the bet for that particular match. He and his sports buddies have a friendly EPL bet going on and the winner will be treated to a nice fancy lunch when the football season ends. So far, it doesn't seem like B is winning. He's very well versed in football and makes pretty good bets but right now he appears to be on a losing streak. Perhaps I should steer his attention towards Football4profit. A top resource for football and Sports Betting advice and reviews of online bookmakers, this informative site will help anyone in the loop stay up to date on sports betting odds. Aside from free bets from premier online betting sites, one can also get information on other sports including cricket, golf, football, rugby, tennis and many more. I hope B likes my find. Perhaps some tips from the pros will help improve his odds. Good luck B! hahah.. too cute.. I love ti!! pheebs looks so cute as always and I can just imagine Benji chasing the football... lol!! So chubby Benji looks from this angle GP!! so fluffy!!! so cutee!!!! So cute in her shirt!! Recent blog:=- Cute Giveaway: The Cutest Little Soaps You Ever Did See! U getting ready for MM, Mon? no song yet Mariuca! u?? No need to be scared of meows, woofs maybe but def not meows ha ha ha! Hahhahaha yeah la don like la when so many ppl joined edi, sure my MM will be lost then lol! I made it Mon, see the list so fast filled up…crazy LOL!! So fast within seconds the top 10 filled up lol! Thanks LR, I love seeing my cats in baju heheh!